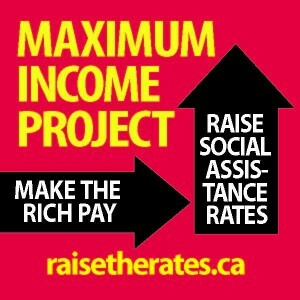 The Maximum Income Project is a satirical campaign that mocks provincial hypocrisy on poverty while making serious demands for an Immediate raise to social assistance rates. 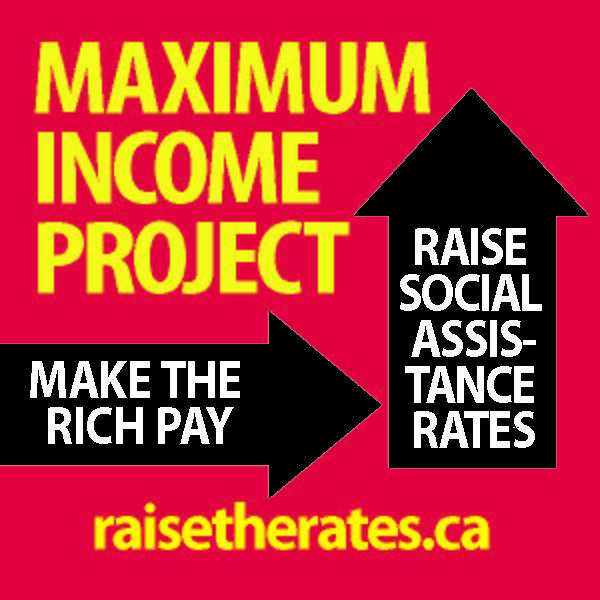 On Thursday, April 6, members of the Raise the Rates Coalition, which includes anti-poverty organizations and public sector unions, will launch the satirical ‘Maximum Income Pilot Project’ campaign taking aim at the provincial government’s sorry record on poverty. The Liberals have now spent nearly 10 years talking about poverty reduction – all the while cutting real incomes of people on social assistance vis-a-vis inflation. Endless cycles of consultations, studies, a Commission to Review Social Assistance, and a recent proposal to pilot a Basic Income Project have been used to defer the most logical action – raising social assistance rates. While poor people are told to keep consulting, successive budgets have provided billions of dollars worth of tax breaks to corporations and the rich. The ‘Maximum Income Project’ proposes the most obvious action to decrease poverty – take away the excess wealth the Liberals have helped the rich accumulate and redistribute it. In his discussion paper on the proposed Basic Income Pilot, which the Liberals commissioned, former Conservative Senator Hugh Segal proposes providing small sampling of poor people $1320 with no strings attached for three years ($1820 for those on disability), bringing people up to 75% of the poverty line. The Raise the Rates Coalition argues there is no reason to wait, the results are obvious, poor people will be better off on every measure imaginable. Instead of delaying action, everyone currently on social assistance must be brought up to these ‘Segal rates’ immediately, an endeavour that will cost the province an additional $4 billion. The Maximum Income Pilot Project will provide the means to raise that revenue by reversing corporate tax cuts and instituting a truly redistributive taxation system. The campaign launch will take place at the Royal Bank of Canada Annual General Meeting, scheduled for Thursday, April 6 at the Sony Centre for Performing Arts. The bank was deemed as the appropriate target for the launch given the profits it has reaped through its various collaborations with the Social Assistance bureaucracy in Ontario. Members of the Coalition will attempt to get the Maximum Income Pilot Project tabled for discussion on the AGM agenda, following the launch celebration at 9am. Join Us! If you are interested in getting involved in the campaign to raise the rates email us at raisetheratescampaign[at]gmail.com. This entry was posted in Raise the Rates on April 4, 2017 by Ontario Coalition Against Poverty.